The Quickie is a mini relationship Tarot spread is one you can use any time when you just want a snappy overview of the relationship. It shows you the main theme, as well as the individual lessons of each person. Pulling an additional tarot or oracle card is optional and please feel free to choose any deck you like. 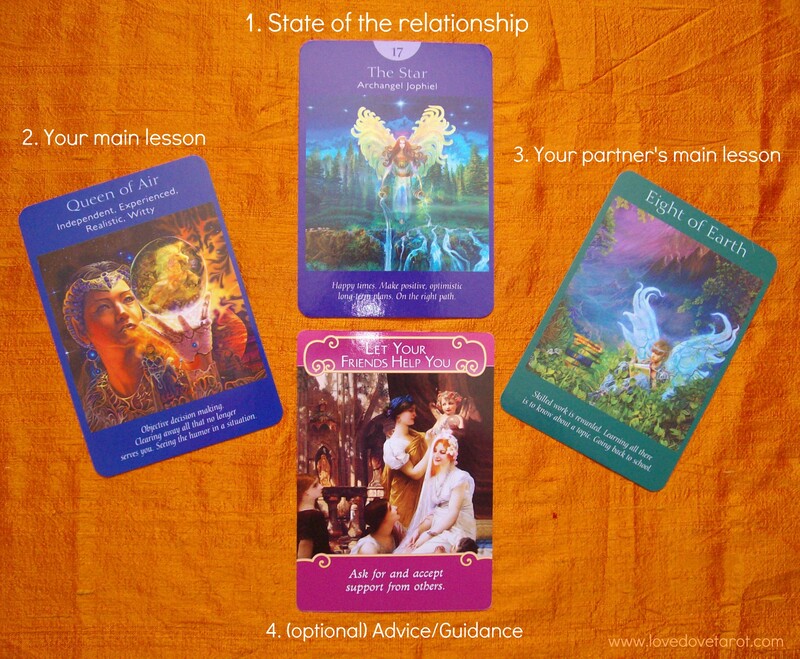 I have chosen to illustrate this spread with cards from Doreen Virtue’s Angel Tarot cards (see a review of this deck HERE) and the Romance Angels Oracle. 1. State of the relationship/Central theme: The Star (Archangel Jophiel) – You have every reason to be optimistic about your relationship. It’s finally back on track and you can look to the future with renewed optimism. Establish a relationship based on trust where you treat each other as best friends as well as lovers. Communication should flow more easily now and there is greater transparency between you. 2. Your lesson: Queen of Air/Swords – You have managed to detach enough to gain a better perspective of the true dynamics at work. You are now able to laugh at yourself and the old patterns that you have managed to free yourself from. Watch out for a tendency to be cynical or judgemental. 3. Your partner’s lesson: 8 of Earth/Pentacles – Having the relationship back on track frees up energy for your partner to focus on work again, and to learn necessary new skills as focuses on a new path that will be financially viable. Watch out for a tendency to devote all your energy to work. 4. Advice card: Let Your Friends Help You – Ask your close friends for advice about any little niggles you may have. This could also be a reminder to not let go of newly reformed friendship bonds just because your love life is back on track. Thriving friendships help the relationship stay healthy too!